Ready for some Tangram Puzzles! The tangram is an ancient Chinese puzzle made up of seven geometric shapes that cab be used to lots and lots of pictures. To get started making a set of tangrams, a piece of construction works great. Now grab a pair of scissors and you can watch the short video below that will show you how to easily make a tangram set. Make Your Own Tangram Set Video...Watch this short video to get started making your tangram set. 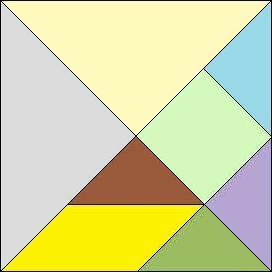 If you already have a set of tangrams then you can jump right to sovling the tangram puzzles. Try to construct the tangram cat using you 7 tangram shapes. It might seem difficult at first, but soon you should get the hang of it. Can't solve it? Don't worry you can check out the tangram solution to see how it's done.